The Mother’s grace is boundless and her mercy is unlimited. Her knowledge, infinite. Her power, immeasurable. Her glory, infallible. And her splendor, indescribable. She gives material prosperity as well as spiritual freedom. Approach her with an open heart. If we make a total, unreserved, and ungrudging self-surrender to her, we can kill the enemies of egoism, cunningness, selfishness, and crookedness. She can be worshipped by singing her praise, and performing kumkum pujas and havans, especially during this powerful period of nine days. Sharad Navaratri – Dussehra is the most suitable occasion for doing intense spiritual practices. Divine Mother has taken many incarnations (different ways) to destroy Mahishasura (great demon – identities/egos). Sharad Navaratri – Dussehra worships the nine incarnations. If you click on each link, you can read the details about each day. We recommend you read about the upcoming day on the evening before. This will give you more understanding of the ceremonies. According to the Puranas (ancient Vedic scriptures), there are two stories behind this nine-day festival. It commemorates the victory of Lord Rama over Ravana and the Goddess Durga over Mahishasura (in other words, victory over identities/egos). These victories are celebrated on Victory Day, the last day of the festival. Sharad Navaratri – Dussehra has different focuses on different days. On one of the days, the Mother Goddess in the form of Annapurna Devi is invoked to start the new harvest season that begins at this time and to reactivate the vitality and fertility of the soil. On the last day, popularly known as Vijaya Dasami (Vijaya means victory, Dasami means 10th Vedic day of the Vedic month), people will do pujas for their vehicles. Celebrating Sharannavaratri in the fall season (Sharad Ruthu) is called Sharad Navaratri. 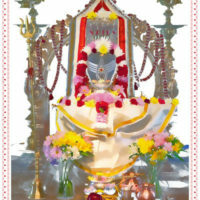 During this time, called Sharad Navaratri, we invoke Goddess Parvathi. This popular festival is celebrated in September or October, in the Vedic month called Ashwayuja, on new moon day to full moon day (shukla), and on the first day of the Vedic month called prathipad. You could say that the sunrise is Lakshmi, the sun at high noon is Gayatri, and the sunset is Saraswathi. What good is it to know that? Well, when you hear about and get a feel for each aspect of divinity, and then feel what the sunrise feels like, what high noon feels like, and what the sunset feels like, there is a poetry to it that is very sweet to the soul. Is it necessary? No. The more you reflect on them and explore feeling them, the more it cultivates your heart. Human evolution is about the mind and the heart. You have to evolve both. Cosmic consciousness, the very first step of enlightenment is very much a mind thing. Then, it goes heart and mind, heart and mind. 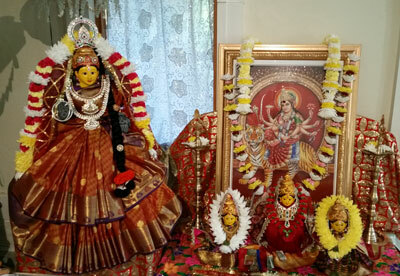 Each day of Sharad Navaratri – Dussehra, there will be a Kumkum Puja at 5:00 pm for a different aspect of Mother Divine. Please see the list above for dates. There is no hymn greater than Sri Lalitha Sahasranama. Out of 1,000 names, each name is a powerful mantra. Those who chant or listen to these sacred names while doing Kumkum Puja on divine days will be surrounded by unimaginably powerful cosmic vibrations, bringing every kind of blessing. Those who have not learned to chant these names can at least listen to them and transcend on them. Mother Divine likes kumkum, among all the offerings such as flowers, fruits, turmeric rice, sandalwood powder, etc. So, kumkum, whose base is turmeric, has medicinal and aromatic properties. Worshipping Divine Mother with kumkum is an easy way to approach her lotus feet. Those who apply the offered kumkum on their forehead will be protected from the negative energies since kumkum helps to balance the nervous system and restore our cosmic vision and power. The Kumkum Puja is performed for longevity of husbands and for prosperity, wealth, money, or any other things we need in daily life. Unmarried women can perform this puja for a good life partner. For all worshippers, Divine Mother can be experienced in the form of an unbounded ocean of pure, motherly love. Bala Tripura Sundari Devi is represented as an 8-year-old little girl, a form of the Mother goddess. Tripura means she is beyond rajas, tamas, and sattwa, beyond the relative world. Tripura Sundari could be likened to a sprout full of shakthi. In her adolescence, she becomes Lalitha Tripura Sundari Devi. At her fullest development, she becomes Shri Vidya Shakthi, the mother of the universe. Even though Shri Bala Tripura Sundari is represented as a little girl, she is described as the divine combination of the wisdom of the Goddess Saraswathi, the magnetic energy of the Goddess Maha Kaali, and the prosperity of Mahalakshmi. The sprout has within it the full potential of every aspect of the entire plant. Lalitha Tripura Sundari Devi is the mother of the whole universe in the form of a playful adolescent. Each of the male gods (Shiva, Vishnu, etc.) gave her some of their power, providing her with her power, shakthi, known as the feminine power. Shakthi Lalitha is the Goddess of bliss. Lalitha means "she who plays" and "spontaneous." She can be worshipped to gain total salvation. Gayatri Devi is the mother of the Vedas. Gayatri Devi, herself, is a highly revered mantra from a hymn of the Rig Veda attributed to the Rishi, Viswamithra. When Viswamithra was performing innumerable iterations of the Gayatri mantra, Gayatri appeared with 5 heads, representing the 5 elements. One worships her to attain spiritual knowledge: "Oh Goddess, giver of life, remover of all pain and sorrows, bestower of happiness, the creator of the universe, thou art most luminous, adorable, and the destroyer of sins. We meditate upon thee. May thou inspire, enlighten, and guide our intellect in the right direction." Annapurna literally means "full of food," but is normally translated as Goddess of the Harvests. Annapurna Devi is the universal and timeless kitchen goddess… the mother who feeds. Without her, there is starvation, a universal fear. Her association with food (source of wealth) led her in time to be transformed into Lakshmi, the Goddess of wealth. More specifically, she is called Dhanya Lakshmi, who is the form of Lakshmi known as the Goddess of food. Lakshmi means in Sanskrit "to perceive or observe." This is synonymous with Lakshya, meaning "aim" or "objective." She is the one who has the object and aim of uplifting mankind. Lakshmi is the Goddess of light, beauty, good fortune, power, luxury, fertility, auspiciousness, and wealth. She holds the promise of material fulfillment and contentment. Being the consort of Vishnu, Lakshmi also signifies love and grace. While Lakshmi is generally worshipped to achieve success, she does not reside long with anyone who is lazy or desires her only for wealth. Maha Lakshmi Havan can be performed for desires, goals, issues, or problems. It can be requested for any purpose or motivation as long as it is for the highest good. By performing the Maha Lakshmi Havan, one attains progress, evolution, growth, co-creation of good present karma and co–creation of good future karma. So, this havan is for more happiness, a better life, more peace of mind, and more support of nature. With the help of this havan, one can attain spiritual, emotional, mental, physical, and material fulfillment. Also, love, marriage, relationship, children, health, wealth, and prosperity. Saraswathi Devi is the Goddess of knowledge, music, and the arts. Saraswathi Devi is the mother of the Vedas. The name, Saraswathi, came from "Saras," meaning flow and "wathi," meaning a woman. So, Saraswathi is the symbol of knowledge, whose flow and growth is like a river. Divine Knowledge is supremely alluring like a beautiful woman. With her grace, one can attain knowledge, achievement in the arts, and good education. The students who invoke Saraswathi Devi on this auspicious day will become wise and meritorious in their school achievements, career preparation, and educational progress. Durga is an incarnation of Divine Mother, a unified symbol of all divine forces. The name, "Durga", in Sanskrit means invisible. The name, Durga, is formed with Du + r+ ga. Du is synonymous with the four devils: poverty, suffering, famine, and evil habits. R refers to disease. Ga is the destroyer of sins, injustice, lack of spirituality, cruelty, and laziness. Durga killed the powerful demon Mahishasura (identities/egos). Demonic forces (poverty, suffering, famine, and evil habits) are self-destructive, but very powerful. When demonic forces (identities/egos) create imbalance, all gods unite, becoming one divine force called Shakthi or Durga. "Saptha" means seven and "shati" means hundred. 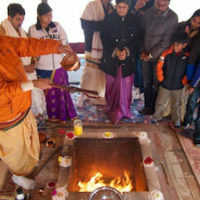 Seven hundred Durga mantras are chanted in this very powerful havan. Divine Mother, Durga is a combination of Kali, Lakshmi, and Saraswathi. Goddess Kali removes the negativity, Goddess Lakshmi gives all kinds of wealth, and Goddess Saraswathi gives the knowledge and spiritual power. Divine Mother, Durga, exists in all beings in the form of intelligence, mercy, and beauty. She is the consort of Lord Shiva, who creates, sustains, and destroys the universe. Durga is the energy aspect of Lord Shiva. Without Durga, Shiva has no expression in relativity. Without Shiva, Durga has no existence. Shiva is the soul of Durga. Durga is identical to Shiva. Lord Shiva is only the silent witness. He is motionless and absolutely changeless. He is not affected by the cosmic play. It is Durga who manifests and does everything. Shakthi is the power of cosmic energy of the Lord. Divine Mother Durga (also known as Chandi) sits on a lion and is represented as having ten different weapons in her hands. She keeps up the play of the Lord through the three attributes of nature, namely sattwa, rajas, and tamas. "Mahisha" is a Sanskrit word meaning buffalo. Mahishasura (great demon – egos/identities) has a buffalo head and a human body. He is therefore able to change between human and buffalo at will. Mahishasura started terrorizing heaven and earth. He invaded heaven, defeating Indra, the king of Gods, and drove all of the gods out of heaven. Then Durga Shakthi, the combined power of all gods, in a beautiful form, started fighting with Mahishasura. After nine days of fighting, during which Mahishasura’s army was decimated, she finally killed ("mardhan" being the Sanskrit word for killed) him on the ninth (the number 9 is auspicious) day of the waxing moon. Durga is therefore called Mahishasura Mardini, the destroyer of Mahishasura. During several battles, Durga (Mahishasura Mardini) incarnated as Maha Kaali, fighting with Mahishasura (great demon – egos/identities). Likewise, Mahishasura took an incarnation as Raktabija. He had the magic boon that every drop of blood he shed on the ground would become another Raktabija, named literally "the blood boon." Hence, Maha Kaali spread her giant tongue and drank up all the blood before it fell to earth, destroying him. Raja Rajeswari Devi is the presiding deity of Sri Chakra (all of the chakras together, making up the whole universe). She is the mother of love and grace. After Mahishasura’s (great demon – egos/identities) death, the power (shakthi) became Raja Rajeswari Devi. She has four hands and three eyes. She wields in her four hands the noose, the goad, sugarcane, bow and five flowered arrows. Her three eyes represent sun, moon, and fire – the incarnation of the triad. Her crown is decorated with the crescent moon, the symbol of divine delight. The noose represents strong determination and love by which she binds all of creation. The goad symbolizes the wrath of fiery emotions by which the whole creation is spurred into activity. The sugarcane stem depicts the mind principle of man. The five flowered arrows are the five tanmatras: sound, touch, form, taste, and smell – the source of the five elements. The power, shakthi, created both the gods and demons in the first place. In order to access that power, each god must reverse the unfolding of divine manifestation. This reversal is called "cosmic tatvas." This is also the goal of any sadhana (the process of dissolving egos/identities) undertaken by a devotee. To help understand the lesson offered here, think of Mahishasura as an individual’s egos/identities. Mahishasura controls our minds and sensory organs, and holds the key to Transcendental knowledge. She resides on the top of the head, Sahasrara, and also in the second chakra, Swadhisthana. She has three forms: the gross physical form (Sthulasharira), subtle energetic form (Sukshmasharira), and the form at the level of the quantum mechanical realm. When one meditates on her, this ultimate energy goes to the first and second chakra (Muladhara = first chakra, Swadhishtana = second chakra). She manifests out of the lotus chakras as the kundalini, the supreme power elevating the spiritual aspirant. According to Devi Mahatyam (an ancient scripture), the gods saw an exceedingly fiery mass, like a flaming mountain. That peerless splendor, born from the bodies of all the gods, unifying and pervading the triple world with their luster, became a woman. She is Mahadevi, the great goddess, the mother of all beings, divine mortal, taking the warrior form of Goddess Durga. She departs on her lion mount to meet the demon. If we worship Divine Mother during these nine days, the graceful mother removes evil (egos/identities) and develops goodness within all of us. "She is the power of Brahman, pure Consciousness embodied. She is the bliss of existence and knowledge."